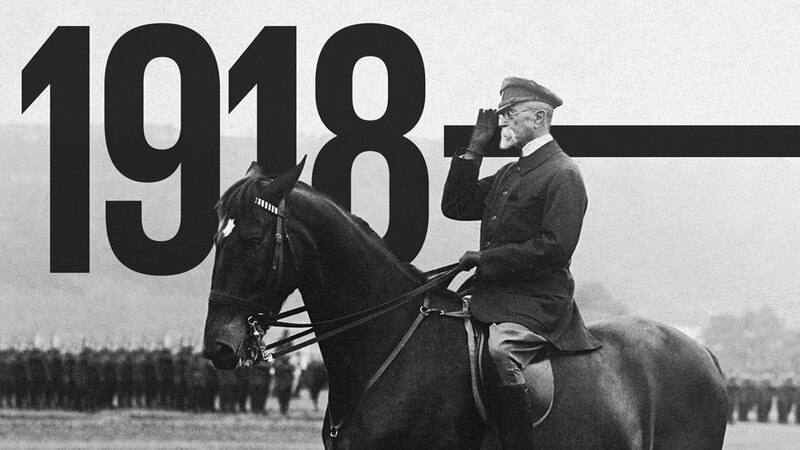 Tomorrow, on October 28th, it will be 100 years from the moment when Czechoslovakia was created by declaring the independence. Austria-Hungary, guaranteed to lose the First World War, ceased to exist. The stellar Czechoslovak example allowed other nations to gain independence as well. For example, Yugoslavia declared its existence one day after Czechoslovakia did – it will be 100 years on Monday. Czechs have lived along with Germans – Bohemia was the only legally allowed kingdom within the Holy Roman Empire – and/or Austrians for almost 1000 years, let's say from 1002 AD. That millennium was a millennium of sometimes very negative and sometimes positive experiences with the German-speaking nations. Czechs and Slovaks are full-blown Slavic nations, don't get me wrong. But foreigners typically overstate the similarity between Slavic nations. Czechs have been so tightly integrated to the German-speaking empires largely because we have always had some respect for Germans and a degree of loyalty. Throughout the millennium, there have been some very bad things that German speakers did to us. They mostly fought against our Protestantism, forced Catholicism on us, ignited the population and cultural decline of the Czech nation especially after 1620, and many other things. The Holy Roman Empire and Austria have done lots of good things for us, too. They were the interface through which Bohemia was getting lots of the achievements from the Western European civilizations into which Czechia or Czechoslovakia has belonged up to 1948. In the late 19th and early 20th century, Czechs and Slovaks were rather satisfied with the monarchy. They didn't even "credibly demand" the promotion of their lands to the Austrian level, like the Hungarians successfully did in 1867. Most Czechs loved the long-serving emperor Franz Joseph I as well as his young successor who took over in 1916, Charles I. During the year 1918, the situation changed dramatically. The independence wasn't preferred by most Czech politicians and those who did want the independence were a fringe. But things changed outside: some very skillful diplomat, especially Prof Thomas Garrigue Masaryk, our George Washington (President-Founder) who had an American wife, Dr Edvard Beneš, and astronomer-pilot Milan Rastislav Štefánik did some incredible diplomatic job abroad. Before the independence was declared, the Cosmopolitan and domestic parts of the pro-independence movement merged – and were known as the Maffie (a playful name, indeed). 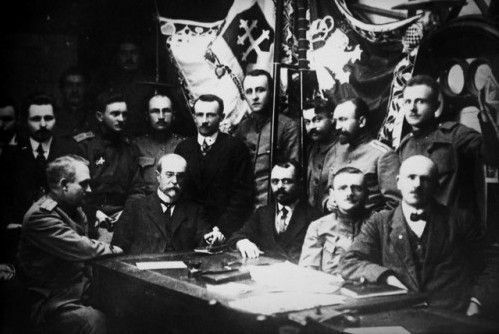 With some help from the Czech and Slovak emigrants in the U.S., they persuaded the U.S. president Woodrow Wilson, leaders of France, and some other nations that Europe would be a better place if Austria-Hungary were peacefully dissolved and replaced by successor states such as Czechoslovakia. To a large extent, this new reorganization of Central Europe was therefore "prescribed" from the U.S. The pro-independence fringe of the Czech politicians quickly became the Czech mainstream and the independence was unstoppable. Who was Masaryk, our president-founder? He was a professor of some social sciences who lived between 1850 and 1937 – impressive age 87. He was brave and in the late 19th century, fought against anti-Semitic prejudices during the so-called Hilsner Affair. He realized that our "extremely old manuscripts" were actually forgeries and the Czech literature wasn't as old as the French or German one but some 2 centuries younger. He did lots of mature things. The video above is from November 1929 – which may have been close to the greatest moment of Czechoslovakia. Masaryk was asked by Fox News to record a YouTube video (OK, by Fox Movietone News), and he focused on his vision that the media technology would profoundly change the future. Some of the comments were naive (Masaryk has believed that YouTube would force people to be honest... is that really true?) but he was likeable, smart, and pleasure to be around. You can see that his English was idiosyncratic but it was just enough to do some world-changing things. OK, on October 28th, Czech people came to the streets of Prague – it's especially the Wenceslaus Square in the 13-minute video above. They demanded some change. Lots of them were rather ordinary people so they screamed not just "republic" but a "socialist republic". On the other hand, the first PM Karel Kramář, a top guy from the domestic pro-independence resistence, was a conservative of his own kind and (in 1914) wanted the Russian tsar to be the formal head of Czechoslovakia! ;-) I will return to the degree of left-wing penetration in Czechoslovakia in a minute. They didn't know that they were doing history but they did history. You can see that the people had elegant – although too uniform – outfits. All the men had suits and hats of some kind. Bohemia was the most industrialized part of Austria-Hungary but it wasn't too wealthy. Some new research claims that our GDP per capita was just 80% of the Austrian or German ones – which were similar. We didn't enjoy all the bribing around the capital (like Berlin and Vienna) that made those German-speaking nations even with their lower degree of industrialization. The life expectancy was just a shocking 44 years in 1918. It's hard to find out whether it's because of the high natality rate (if you include the lifetime near zero of the newborns who die, you can get low averages easily) or the high number of people killed in the war or whether it's genuine. By now, the life expectancy grew to almost 80 years (82 women, 76 men). The progress is clear. The diseases such as TBC used to be everywhere, they have basically disappeared. The cause of death has moved to cardiovascular diseases and cancer. Their typical salary was CSK (Czechoslovak crown) 150-250 a month. That was enough just for 77 kg of bread. People clearly had to pay a huge fraction of their money for food. These days, the average salary is over CZK 30,000 a month and you can buy a ton of bread. Relatively to the present, the people were incredibly poor in 1918. It's sort of amazing to realize how well dressed they were. Czechoslovakia was actually first declared on October 26th, 1918 in Pittsburgh, a city we heard about in recent days for less optimistic reasons. In that city, the preparations (work done by Czech and Slovak expats) were completed as the Pittsburgh Agreement in May 1918 – mostly a strengthening of the 10th among Fourteen Points made by Wilson in January 1914 (which brought him the 1919 Nobel Peace Prize). If you thought that Pennsylvania was too provincial and hasn't rewritten the world maps, you were wrong. Czechoslovakia, despite the awkward name that was created as a neologism, became the world history's most rapidly recognized new country and it served as the best success story among Austria-Hungary's successor state. Austria and Hungary lived in their grievances – as losers of the First World War – and the countries were spoiled by constant brutal infighting. By the late 1920s, Czechoslovakia grew into one of the top 7-8 largest economies in the world, surely ahead of the likes of Austria. (Czechia, not damaged much by the war, also had a higher GDP per capita than Germany or France in 1946.) But the path wasn't straightforward. Alois Rašín, a very practical man, became the first finance minister. He saw inflation that was kicking in in the adjacent countries and decided to fight it. He created the new currency, Czechoslovak crown, at par with the Austrian-Hungarian crown (which was coined by Franz Joseph I in 1892, and defined as 1/2 of the older golden coin). And he was determined to make it a hard currency. And he surely succeeded. Maybe too much. The too strong crown created another economic downturn around 1922. Exports dropped, he was hated by certain folks – and assassinated by an anarcho-communist piece of šit named Josef Šoupal in 1923. But the strong crown policy wasn't really abolished and the Czech economy was ultimately capable of adapt to it just fine. Tomáš Baťa Sr, the founder of the Bata Shoes company in Zlín, was perhaps the most celebrated entrepreneur of the First Republic of Czechoslovakia (1918-1938). He did lots of great things for his employees who were happy. A big part of his ingenious management was about the ability to deal with the strong crown and pay salaries based on different formulae to different people. OK, how could he survive the hard currency? He created an internal ecosystem within his company that was shielded from the external world. So people weren't paid too much but he made sure that they could buy everything they needed because within his factories, things were incredibly cheap. Czechoslovakia worked as a vibrant democracy with many parties, left-wing and right-wing ones that represented various classes etc. Up to his death, Masaryk himself was treated as an unchallenged authority of a sort. In this sense, Czechoslovakia was a RINO (republic in name only) because Masaryk's status seemed like a continuation of the status of the emperors. A huge industrial and civilization progress was achieved in Slovakia and also in the Subcarpathian Rus, previously a part of Hungary and now a Western piece of Ukraine, which Czechs treated as "our Orient" or "our colony". It was really the Czechs that turned that underdeveloped šithole into a part of the civilization – schools, attorneys for everybody, healthcare, new suburbs, and so on. As the Czechoslovak nation was getting richer, the production of culture exploded. There were lots of important writers, like Karel Čapek – the guy who coined the word "robot" in a play, helped by his brother, painter Josef Čapek. Karel Čapek was a close friend of Masaryk's. On top of that, music schools were everywhere, all the people were singing. Inside every Czech, there was a musician, was especially true during the First Republic of Czechoslovakia. Karel Vlach, a top musician who made swing explode in Czechoslovakia, probably composed the melody of this happy song. "Once upon a time, there was a girl, she loved a boy in a cap... who grew into a Herkules..." and they were walking alone or together, and then as pensioners, you can imagine how a happy playful love story of their lives looked. The singers were Allan Sisters – they were still active during the Nazi occupation. "Life is just a coincidence, once you are up, once you are down. Life flows like water and death is like the sea." ... And the lyrics continues to elaborate and to rigorously prove the point that the analogy between the water and life/love works. ;-) You know, these are happy and undemanding songs but Ježek was a truly brilliant jazz composer. Czechoslovakia was also producing tons of movies. For example, Oldřich Nový was their Casanova of choice – well, Kristián was first shown in 1939, already in the Protectorate. Some of them were really good. The industry had some cool brands (Czechoslovakia was e.g. a superpower in making cars). Its cultural front was somewhat left-leaning – but of course not as extremely as what we see in the Western world today. Social democracy was an important party but the communists remained under control (although they did participate at some governments) – and their impact has only exploded due to their being such an important anti-Nazi group. In the 1930s, the Great Depression began. It affected Czechoslovakia slightly more than it affected other nations – not that it was lethal – and the Sudetenland Germans were more affected than the average Czechoslovaks. Hitler found a "solution to all problems" in the adjacent Germany. Our German minority became a bunch of blind fans of Hitler – NSDAP's subsidiary got over 90 percent among them. By the mid 1930s, the co-existence between Czechs and Slovaks in the Sudetenland became hell. And make no mistake about it, it was the Germans' fault. They got everything they needed, they had the highest number of schools, books, newspapers, ... per capita among all German minorities in the world. But they still thought it was a good idea to work on the annexation by Nazi Germany and the destruction of Czechoslovakia. At that moment, people could realize that Masaryk's suggestions that we would be a problem-free country at the ethnic level was deceitful to a large extent. After some 4 years, the reconstruction of the National Museum at the top of the Wenceslaus Square is finally over. The videomapping video above was truncated to 3 minutes (full here, worse angles) but it's reasonably amusing, showing the world wars, Voskovec+Werich, Czech dome in Hiroshima, Velvet Revolution, Nagano ice-hockey tournament etc. I still found the Orloj Astronomical Clock videomapping slightly better. There was also a big military parade and fireworks. First, in 1918, they invented the paradigm about one Czechoslovak nation and one Czechoslovak language (with two realizations, Czech and Slovak). It wasn't quite a coincidence. It was politically needed because the Czechoslovak nation had a clear majority in Czechoslovakia. If Slovaks were separate, their size would be comparable to the ethnic German minority and it would seem fair to treat the Germans really like Slovaks – like one of the ethnic groups that forms the basis of the country. Clearly, Masaryk and others didn't want it. They wanted Germans to be seen as a largely small minority that is inconsequential in the big picture. In the late 1930s, the ethnic Germans became more than consequential. They not only destroyed Czechoslovakia but made the Second World War unstoppable. In the 1930s, Czechoslovakia was ahead of the world in recognizing the threats of Nazism. It was common sense among writers – such as Čapek who wrote some plays showing how totalitarianism is bad – as well as politicians and the general public to appreciate that the changes occurring in Germany were dangerous and uncivilized. Czechoslovakia really had the prevailing view that was very modern and extremely close to the present views – which consider Nazism as a "self-evident evil" and the word "Nazi" is basically an insult. No other nation saw these things as clearly in the 1930s as Czechoslovakia did. But no one really listened to us. I think it's very sad that our alliances with France, the U.S., and indirectly the U.K. turned out to be so weak in practice. It's bad that those Western nations didn't try to follow our culture and political discourse much more closely. There was so much they could have learned. They didn't. So instead, Britain, France, and others sank into some kind of a "soft cult of Adolf Hitler" and they were totally deluded about all the basic questions. Maybe the cultural barrier must be blamed – a "mostly Slavic" nation just isn't "our kin", the Yankees, Briton, and French probably still feel. But this instinctive view was completely wrong and unfortunate because when it came to most of the important questions, we were belonging to the same kin. In Fall 1939, Britain and France chose Germany as their partner to create "peace of our time". Instead, they prepared the prerequisites for the war and made sure that it would be one of the most brutal wars in the history. Because of the German grievances that energized Hitler, the Second World War was a largely unavoidable consequence of the results of the First World War. But in 1938, it could have been stopped. It wasn't. Because it wasn't stopped, the world had to go through another world war, and the spread of communism was then largely unavoidable as well – because it was guaranteed that Czechoslovakia and countries further to the East would consider the Soviet Union a more reliable ally than the Western countries which is why they were almost guaranteed to join the Soviet bloc at some moment. It's terrible that the international chemistry e.g. between Britons and Czechoslovaks never exploded, that they weren't listening to each other systematically or nurturing their alliances. Lots of the tragic events from the world history could have been avoided. I think that a nearly identical problem creates bad conditions for some developments in the foreseeable future, too. The Brussels regime morphs into an increasingly aggressive totalitarian regime and some countries – starting from the U.K. and the Visegrád Group, and perhaps Italy and others – see this danger rather clearly. But unlike the pro-totalitarian "core" of the European Union, they don't really try to listen to each other too much, they don't behave as authentic friends and allies. The EU, as the Fourth Reich, may very well get self-confidence enough to do similar things as its Third counterpart did. Many of you in the West should try to listen to V4 music or read V4 books or newspapers etc. – in a way that would be at least somewhat analogous to the attention that some of us pay to the events in Western Europe and the U.S.